Peterborough Sports consolidated top spot in Evo Stik League Division One Central with a five-star showing yesterday (March 30). 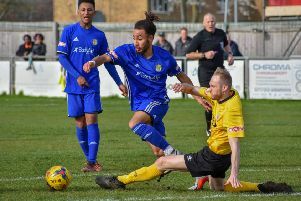 The city side scored five second half goals to beat AFC Dunstable 5-0 to remain two points clear at the summit with a game in hand on second-placed Bromsgrove Sporting. Their goalscorers were Joshua McCammon (47mins), Stuart Wall (53mins), Dion Sembie-Ferris (81 and 89 mins) and Mark Jones (90mins). 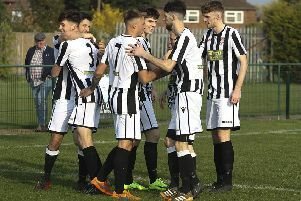 Yaxley gained a welcome 1-0 win at relegation-threatened Aylesbury with Joe Butterworth grabbing the goal in the 11th minute. In the Northern League East Division, mid-table Stamford were beaten 3-0 at home by Marske United after a poor first-half showing that prompted manager Graham Drury to apologise to fans afterwards. Wisbech drew 1-1 at home to AFC Mansfield thanks to a late headed equaliser by Toby Hilliard while Spalding United were beaten 2-1 at home by Ossett United after taking a ninth minute lead through Romario Martin. Spalding are just two points above the drop zone and Wisbech three.